Neuropathy is a condition that affects over 20 millions people causing them pain, discomfort and changing their daily life in multiple ways. It is a condition associated mostly with diabetes but often follows cancer treatment, Shingles infections, and is part of many people’s autoimmune disease. Neuropathy affects flow of blood through vessels causing damage to the peripheral nervous system (PNS). The PNS is a complex web of nerves that connects the central nervous system (CNS) to the rest of the body. The CNS is the primary messaging pathway between the spine and the brain which affects the entire body’s functioning. Neuropathy can affect all the different types of nerves in the body and the pain can present differently for each person. 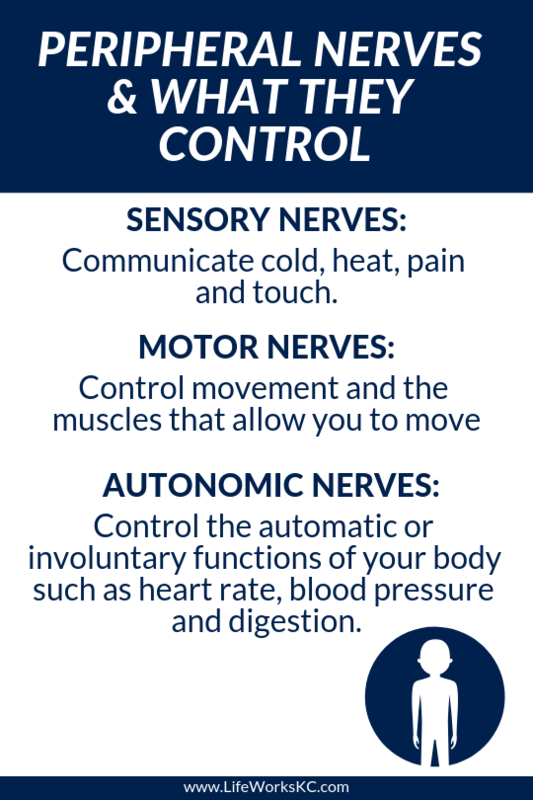 Damage or injury to any of these peripheral nerves can trigger symptoms throughout your body. The most common cause of neuropathy is from poorly controlled blood sugars. 60-70% of people with diabetes get neuropathy at some point. Obviously the longer you have diabetes, the more likely you are to experience neuropathy. Most people experience neuropathy in extremities like feet. When the circulation to the feet is impaired, feeling is lost, skin hardens, and injuries like cuts and blisters from dry cracked skin. Painful infections can go unnoticed, continue worsen and often result in amputation. Many people undergoing through chemotherapy suffer from peripheral neuropathy as a side effect of chemotherapy. Oncologists can sometimes adjust dosage and spacing of treatments to prevent or improve neuropathy. For many people, the neuropathy resolves soon after treatment ends. However, in some cases the damage from the neuropathy is irreversible. While the causes above are most well known, many people have neuropathy for a variety of other reasons. These other reasons are often overlooked until they are quite severe because even doctors are not looking for them in association with other diseases. It is often overlooked that there is treatment available. These are discussed more in depth here. Most often neuropathy is treated with pain medications of some form by doctors who do not either understand nerve pain, or do not know any other options. These come in the form of anti-inflammatory medications (NSAIDs) such as Advil or Aleve as well as drugs commonly used for epilepsy- gabapentin, neurontin, and lyrica – that slow the brain down in order to inhibit the perception of pain. These drugs do nothing for the actual nerve damage or pain, so the disease continues to progress. More on the problems with typical neuropathy treatment here. When NSAID medications fail, and epilepsy medications do not work, narcotics are often used to control the pain associated with neuropathy, but at LifeWorks Integrative Health, we understand nerve pain. We aim to understand the root cause of your neuropathy and to support and balance those systems. We develop the personalized neuropathy plan for you based on your needs which includes NASA developed light therapy to stimulate angiogenesis, electric therapy to help reprogram the nerve, regenerative stem cell injections, and nutritional modifications. The right combination of neuropathy treatment is based on your unique pain, health history, and lifestyle. Trust the team that understands nerve pain, not medications that temporarily cover it up.